Sweet, flavorful oranges are a popular snack, and with good reason. One orange provides a whole day’s worth of vitamin C; and you’d have to eat seven bowls of cornflakes to get the same amount of fiber found in one orange, according to the Indian River Select website. Orange trees are small, evergreen trees. They can produce as many as 60,000 white blossoms in the spring. The white blossoms have a sweet, orange-like scent. Bergamot oranges aren’t used for food, but for making oils that are used in perfumes, air fresheners, and cleaners. Only about 20 percent of oranges grown are eaten fresh. The rest are used for juice, flavorings, and jams. Orange trees were first grown in China. The Chinese believe that eating pummelos, the largest citrus fruit, brings good luck. Christopher Columbus brought orange seeds to America in 1493. Today, Florida is the largest orange grower in the U.S., followed by California. 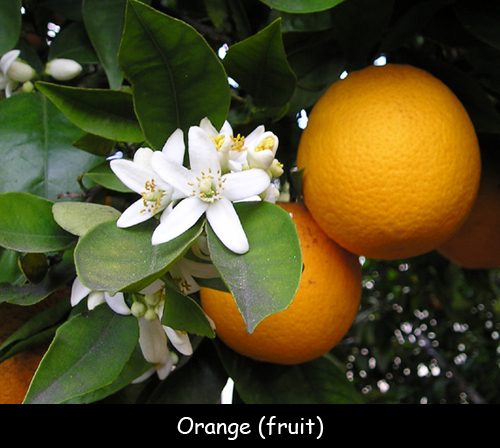 Florida-grown oranges tend to be greener than California oranges. This has to do with the warm nights in Florida. It doesn’t affect the fruit’s flavor. Evergreen: a plant that keeps its leaves year-round. Question: What’s the best way to eat an orange? Answer: There is no one best way. Some people prefer to peel and quarter oranges. Have an adult score the fruit first with a knife to make it easier to peel. Others prefer to cut oranges into quarters. Visit a California orange orchard. Declan, Tobin. " Orange Fruit Facts for Kids ." Easy Science for Kids, Apr 2019. Web. 23 Apr 2019. < https://easyscienceforkids.com/orange-fruit/ >.